The goal of the Product Manager is to make sure the best possible outcome is chosen. It may seem obvious that the products that stand the test of time make decisions based on the best long-term outcomes, but unfortunately for us our brains have the tendency to nudge us towards gratification when it comes to decision making. The ability to distinguish between an Urgent and Important task is a key component to making the best long term decisions. Important tasks will help your product progress towards an end goal. Urgent tasks have minimal (if any) long term benefit, and have a tendency to appear out of nowhere, disguised as important tasks. I see this a lot with bug reports. When users are experiencing an inconvenience they want it fixed, and they want it now. Sometimes the issues are valid, but often they are a small issue that seems big at the time simply because the customer is currently focused on it. Many times there is no bug at all, the customer just wants the feature to function differently. Not every fire that comes up needs to be fought. When there is an upset customer in your office or establishment, it’s easy to cave in and agree to escalate their request. The problem is that when a task is escalated, it is now considered important. If everything is escalated to important, nothing is important. 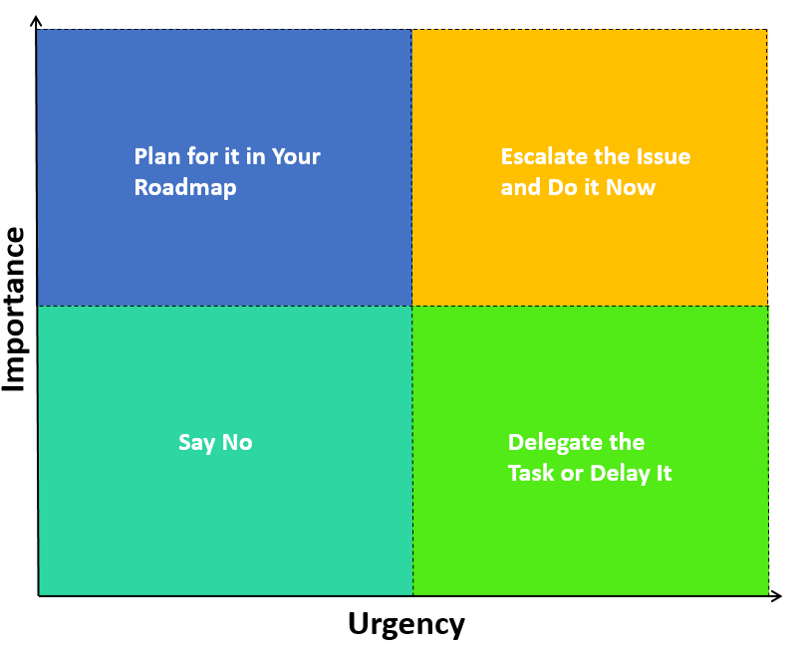 Recognising that a task is urgent but not important allows a Product Manager to either delay the solution, or say No to it altogether. Think of yourself as the gatekeeper to your teams time. Allow your development team to focus on the important tasks required to meet your long term goals. Saying No is tough, and will cause some discomfort, but it will ensure your long term goals are achieved in the shortest time possible. The trade-off of agreeing to urgent work is delaying long term goals. When an urgent task comes your way, determine the level of importance by comparing it to your long term vision and goals. Spend the majority of your time focused on accomplishing important tasks. Time-box a small amount of your week to focus on Urgent tasks, as unfortunately some busy work is unavoidable. As a Product Manager it is important to understand the true cost of a request. There are the apparent costs — adding features cost development time upfront, along with support and maintenance costs going forward. There are also hidden, opportunity costs. Development time is limited, so any time spent building one feature results in time not being spent on another. The cost of choosing to build Feature A is delaying Feature B.
Let’s say Feature A is important but not urgent. Feature B is urgent but not important. There is likely a push for Feature B to be built causing a level of urgency, and the urgency is making Feature B seem important. To contain costs, a product can’t have every feature requested. This is why important decisions are seldom urgent. They often require careful deliberation to make sure they are properly scope. Focusing on your core strategy adds depth to your product’s strengths. This makes it harder for competitors to imitate, improves value with current customers, and makes your strengths easier to communicate to potential customers. Products that are shallow often result in a poor user experience due to workarounds or lack of important functionality. It’s better to have a few feature sets done really well, then a bunch of complicated features. Once your core feature set is solid, maybe look at adding additional feature sets. Wins that seem small and unsubstantial often aren’t, and can quickly spiral out of control. Every time I’ve made the mistake of chasing a short term win, it resulted in multiple follow up requests by the customer, and more sunk development time. The result is either a poor solution, or a derailed roadmap due the amount of time needed for a proper solution. Customers are quick to bring forward problems. Most of these problems also include the customers opinion on how to fix it. If 10 customers report a similar problem, you can almost bet you will also receive 10 different recommendations on how to fix the problem. Many customers do the same thing differently, and the way that customers do things is not necessarily the best way. Focusing on the core problem allows for your team to build the solution customers need, rather than the one they believe they want — this is being prescriptive with your solutions. Figure out the one solution that fits the needs of the majority of customers and run with it. As Steve Jobs famously said, “A lot of times people don’t know what they want until you show it to them.” Once a customer sees a great solution to their problem they will likely be happy, even if it isn’t specifically what they asked for. Finding prescriptive solutions to problems limits both the time spent on resolving the issue, and the complexity added to the product. Adding or removing an item from the blueprint should be a big deal, and should include input from all product teams — sales, development, etc. If you find that your team is adding tasks that are either never getting done, or are constantly adding and removing tasks, the evaluation process for the tasks is not stringent enough. It’s likely that busy work is creeping onto the blueprint. A common misconception is that Product Managers should be making all of the decisions for the blueprint or product strategy. In reality, Product Managers should be ensuring that the best decision is made for the product. The only way to do this is to understand the impacts in all areas of the business. Don’t let your ego get in the way of what is right. By following these simple rules the blueprint becomes a useful tool for your team to focus on important work. Focus at least 80% of your time on completing tasks that work towards blueprint items, the other 20% can be focused on the unavoidable busy work. Keep tabs on your important-work to busy-work split, if it starts to slide to favor busy work you are at risk of delaying important tasks.